Gold can be a flamboyant, edgy, even gaudy color to wear, as anyone who has donned an American Apparel or Herve Leger micro-mini can attest to. However, this season, designers have taken gold to another level, channeling the opulent elegance of the Baroque period and other historic gilded ages. Check out my favorite pieces which epitomize this ultra-luxe trend! 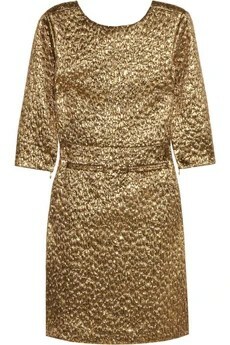 Rochas Metallic Brocade Dress, $1,575. The gold wool and silk-blend brocade which make up this stunning Rochas dress are Old World fabrics, reimagined in a chic, contemporary New World silhouette. 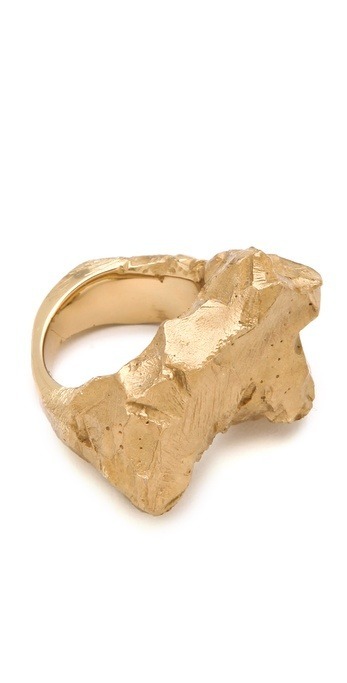 Maison Martin Margiela Solitaire Rock Ring, $320. Maison Martin Margiela is seldom boring, and this brass ring with a gold-colored veneer is an atypical yet very worthy addition to any jewelry collection. I love the sense of rawness juxtaposed with a gilded, artificial material. Rachel Gilbert Annabelle Sequined Satin Dress, $1,275. 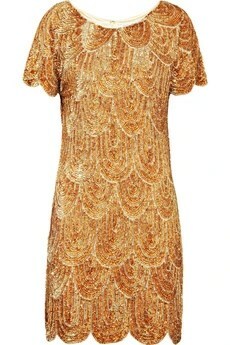 This Jazz-Age inspired frock seems tailor-made for the neo-Daisy Buchanan who wants to feel like a walking work of art. 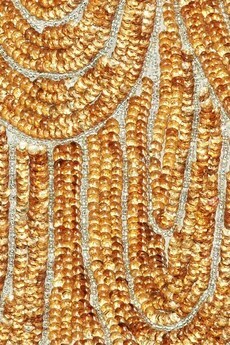 The beading detail is remarkable and the rose-gold color looks especially amazing on darker skin tones. Keep your hair/makeup and accessories contemporary and sleek to avoid looking too costume-y. Bottega Veneta Metallic Jersey Panel Dress, $2,280. For less cost-conscious fashionistas, this beautiful Bottega Veneta investment piece offers a soft gold alternative. I love the very contemporary colorblocking detail combined with a more traditional hem length. Donna Karan Collection Belted Cashmere Jacket, $3,290. This Donna Karan Pre-Fall 2012 look provides just enough gold to make this cashmere piece resemble one of Stephane Rolland´s 14-carat couture confections. Whoever said white shouldn’t be worn after Labor Day obviously did not own this luxe wintry garment. 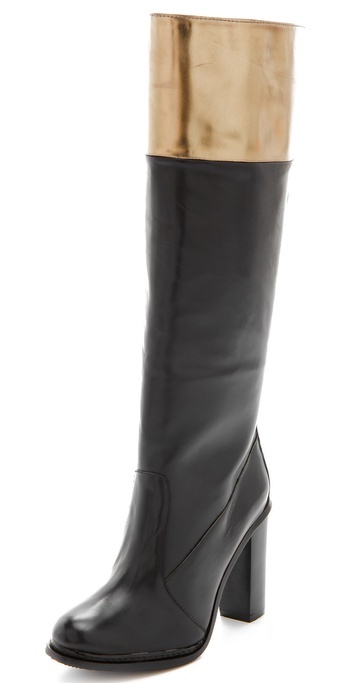 Diane von Furstenberg Shelly High Heel Boots, $498. The go-to black heeled boot is given a regal update with the inclusion of a gold panel. Perfect for a touch of glam amidst the gloom of a New York winter. 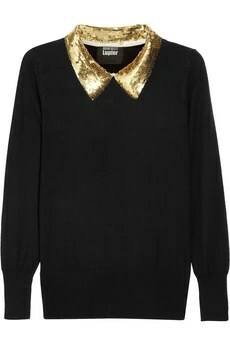 Marcus Lupfer Sequin-Collar Fine Knit Wool Sweater, $410. Another basic is given a bedazzled edge with Marcus Lupfer´s glam-rock sweater. A more budget-friendly way to rock this super-trendy style is to buy a gold detachable collar and match it with a sweater you already own. The $25 ASOS Gold Detachable Collar (available HERE) is my pick.